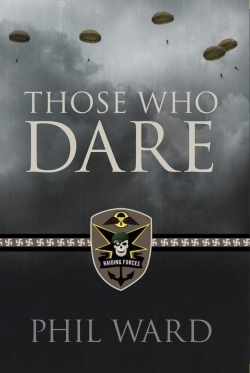 American Lieutenant John Randal’s experiences in the British Commandos’ Small Scale Raiding Forces during World War II provide readers with the opportunity to experience a daring moment in military history. Randal participates in rigorous military training and “pinprick” raids on the Nazi-occupied French coast, an important covert part of the war effort designed to harry the Germans, destroy coastal facilities, and take prisoners who could provide military intelligence to the British..
On the Commandos’ first operation, “the most poorly armed group of modern-day raiders ever imagined” stumbles on Panzer General Ernest von Rittenhauser cavorting in a Mercedes with a “plump strawberry blonde French girl who appeared not to have very many clothes on.” This distinguished prisoner wins them the HMY Arrow, now commandeered for the war effort, and an invitation to train on Lady Jane Seaborn’s estate. As the Blitzkrieg continues and London burns, Randal’s unit learns parachuting only to crawl through ever more grueling training at Scotland’s Castle Achnacarry. The recruits, both in history and the novel, arrive in Scotland to undergo a course of training that begins with the eight-mile “Spean Bridge hike,” a rapid and rugged uphill march to the castle. Once there, they train twenty hours a day with little sleep and less food, hardening themselves to achieve a victory beyond their wildest imaginings. As the men endure, the story bounces, thanks to Ward’s humor, light romantic intrigue, and his amazingly accurate reproduction of 1940s’ British speech, down to every slang phrase and inflection. Randal’s relationship with Lady Seaborn buds decorously as his womanizing compatriots exhibit behavior that, although accurate for the time, would incur charges of sexual harassment today. Ward indulges male fantasy here: every woman in the novel could be on a magazine cover or pin-up calendar. However, they are also high-ranking officers with the same training as the men. Ward is a Vietnam veteran of the United States Army Rangers, a force descended from the British Commandos, and his meticulous attention to military and historical detail honors both. This novel is the first in a planned series of five books.